Many of us spend a lot of time thinking about the things we might consume, and how we might consume them, and we do this not only as individuals, but as friends, partners, and families, and so intensely do we think about our consumption practices that the things we buy and the experiences we engage which are linked to them become invested with emotional significance and central (crutches) to our very identities. The consumption of goods and services is so thoroughly embedded into our ordinary, everyday lives that many aspects of its practice go largely unquestioned – not only the environmental and social consequences have got lost on the way, but also they very notion that consumption itself is a choice, and that, once our basic needs are met, consumption in its symbolic sense is not necessary and thus is itself a choice. In sociological terms one might say that contemporary reflexivity is bounded by consumption – that is to say that most of the things most of us think about in life – be they pertaining to self-construction, relationship maintenance, or instrumental goal-attainment, involve us making choices about (the strictly unnecessary) things we might consume. Even though I think that any attempt to achieve happiness through consumption will ultimately result in misery, I would hardly call anyone who tries to do so stupid – because all they are going is conforming to a number of recent social changes which have led to our society being based around historically high levels of consumption. There are numerous explanations for the growth of a diverse consumer culture and thus the intense levels of unnecessary symbolic consumption engaged in by most people today – the overview taken below is primarily from Joel Stillerman (2015) who seems to identify five major changes which underpin recent changes in consumption since WW2. The first explanation looks to the 1960s counter culture which despite having a reputation for being anti-consumerist, was really more about non-conformity, a rejection of standardised mass-consumption and promoting individual self expression. Ironically, the rejection of standardised consumption became a model for the niche-marketing of today, much of which is targeted towards people who wish to express themselves in any manor of ways – through clothing, music, foodism, craft beers, or experiences. Some members of the counter culture in fact found profit in establishing their own niche-consumer outlets, with even some Punks (surely the Zenith of anti-consumerism?!) going on to develop their own clothing brands. A second discussion surrounding the normalisation of consumerism centres around changes in the class structure, following the work Bourdieu and Featherstone (2000). Basically these theorists see the intensification of consumption as being related to the emergence of the ‘new middle classes’ as a result of technological innovations and social changes leading to an increase in the number of people working in jobs such as the media and fashion. Mike Featherstone focuses on what he calls the importance of ‘cultural intermediaries’ (who mainly work in the entertainment and personal care industries) who have adopted an ‘ethic of self-expression through consumption’ – in which they engage in self-care in order to improve their bodies and skills in order to gain social and economic capital. The values of these early adopters has gradually filtered down to the rest of the population and this has resulted in the ‘aestheticisation of daily life’ – in which more and more people are now engaged in consumption in order to improve themselves and their social standing – as evidenced in various fitness classes, plastic surgery, and a whole load of ‘skills based’ pursuits such as cookery classes (yer signature bake if you like). A third perspective focuses on individualisation – as advanced by the likes of Zygmunt Bauman and Ulrich Beck. In their view, after World War II, universal access to higher education and social welfare benefits in Europe led to the erosion of traditional sources of identity provided by family, traditional authority, and work. Today, individuals are ‘free’ from the chains of external sources of identity, but this freedom comes at a price. Individuals are now compelled to give meaning to their lives without the certainty that they are making the right choice that in the past had come from tradition. Individuals are forced to be reflexive, to examine their own lives and to determine their own identities. In this context, consumption may be a useful vehicle for constructing a life narrative that gives focus and meaning to individuals. As I’ve outlined in numerous blog posts before, Bauman especially sees this is a lot of work for individuals – a never ending task, and a task over which they have no choice but to engage in (actually I disagree here, individuals do have a choice, it’s just not that easy to see it, or carry it through!). Fourthly, Post-modern analyses of consumption focus on the increasing importance of individuals to consumption. Building on the work of Lytoard etc. Firat and Venkatesh (1995) argue that changes to Western cultures have led to the erosion of modernist ideas of progress, overly simplified binary distinctions like production and consumption and the notion of the individual as a unified actor. They suggest that in contemporary societies production and consumption exist in a repeating cycle and retail cites and advertiser have increasingly focussed on producing symbols which individuals consume in order to construct identities. These changes have led to increasing specialising of products and more visually compelling shopping environments, and F and V argue that these changes are liberating for individuals and they seek meaning and identity through consumption, which they can increasingly do outside of markets. Fifthly – other researches have looked at the role of subcultures in contemporary society, where individuals consume in order to signify their identity as part of a group, and doing so can involve quite high levels of consumption, even if these groups appear quite deviant (McAlexander’s 1995 study of Harley Davidson riders looks interesting here, also Kozinet’s study of Star Trek fans). Something which draws on numbers 3,4 and 5 above is the concept of consumer tribes (developed by Cova et al 2007) which are constantly in flux, made up by different individuals whose identities are multiple, diverse and playful – individuals in fact may be part of many tribes and enter and exit them as they choose. Firstly, there are the technological changes which made all of the above possible – the transport links and the communications technologies. Secondly there is the (often discussed) links to the global south as a source of cheap production. Very finally I’m going to add in one more thing to the above – underlying the increase in and diversification of consumption is the fact that time has sped up – in the sense that fashions change faster than ever and products become obsolete faster than ever – hence putting increasing demands on people to spend more time and money year on year to keep up on the consumer treadmill…. So there you have it – there are numerous social trends which lie behind the increase in and diversification of consumption, so the next time you think you’re acting as an individual when you’re getting your latest tattoo, maybe think again matey! A brief summary of Zygmunt Bauman’s Liquid Modernity, chapter one. A level sociology labels Bauman as a postmodern Marxist. The chapter begins with Marcuse’s complaint (writing in the 1970s) that most people don’t see the need to be liberated from society, and of those that do, relatively few are prepared to take action towards liberation, and most of those have little idea of how a more liberated future might be different to our current situation. Next Bauman outlines his conception of liberation, noting that ‘to feel free means to experience no hindrance, obstacle, resistance or any other impediment to the moves intended or desired’. He then argues, following Schopenhauer, that feeling free from constraint means finding a balance between one’s wishes (or imagination) and the stubborn indifference of the world to one’s intentions. This balance might be achieved in two ways – through either expanding one’s capacity to act or through limiting one’s desires (imagination). Distinguishing between these two strategies of emancipation makes possible the distinction between subjective freedom (to do with how one perceives the ‘limits’ to one’s freedom), and objective freedom (pertaining to one’s capacity to actually act). This highlights the fact that people may not be objectively free but feel free because they either fail to realise they are not free, or, more worryingly for Bauman, because they dislike the idea of freedom given the hardships that come along with that freedom, which brings him onto the ‘mixed blessings of freedom’. Bauman now poses two questions (NB this isn’t that clear from the writing!) – firstly, why has freedom been slow to arrive? Secondly, when freedom does arrive, why is it so often seen as a curse? Bauman explores one type of answer to the first question, which is that men are not ready for freedom. These types of answer tend to be accompanied by either pity for the men duped out of their freedom or anger at the masses unwilling to take up their liberty. Such answers are also accompanied by attempts to explain why men do not perceive the need to be free, with the blame being laid variously at a modern culture which replaces ‘having’ with ‘being’; the embourgeoisement of the underdog, or a culture industry which makes us thirst for entertainment rather than spiritual fulfillment. A possible answer to the second question (the answer that Elpenoros would have given) is that men are not prepared to face liberty because of the hardships it brings. This type of answer criticises libertarian notions of Freedom such as those outlined by the likes of Charles Murray in which happiness is related to individual resourcefulness. Murray argues that what fills an event with satisfaction is that ‘I’ did it, but this is flawed, Bauman points out, because being thrown back on one’s own resources also portends a paralysing fear of risk and failure without the right to appeal and seek redress. On a personal note, I would generally agree with this critique of libertarian notions of freedom. The thought of working on projects such as moving house, or clearing my allotment,or, on a larger scale, building an eco-village are much less daunting, and actually only made possible with the co-operation of others. In other words, there is no way to achieve freedom other than to submit to the norms of society – the individual needs society to be free. Total freedom from society means a perpetual agony of indecision and uncertainty about the will of those around you, whereas patterns and routines condensed by social pressures give us road markings, inform us how to act, and give us a sense of certainty in this life. Bauman now outlines arguments which support the view that an element of routine is necessary, citing Fromm’s notion that we need certainty, Richard Sennet’s notion of character, and Giddens’ concept of habit. Having established that the individual needs social norms, some sense of routine to ground himself, Bauman rounds of this section by introducing one of the central problems of living in a postmodern society – that such norms and routines are much less stable than they once were. Citing Deleuze and Guatari’s and Alain Touraine’s ideas he points out that the time has come when we no longer have a social definition of the self, and individuals are expected to define themselves in terms of their own psychological specifity and not society or universal principles. The individual has already been granted all of the freedoms he could have ever dreamed of, and that our social institutions are more than willing to cede the worries of self-definition to individuals, while universal principles which might guide our lives are hard to find. Bauman rounds off this section by suggesting that Marcuse’s pining for communitarianism is outdated because there is no social aspect in which we can re-route the individual, all that is left is the psychologist’s couch and motel beds. The individual has become disembedded and there is nowhere to re-embed. Bauman’s main point here is that our society is still hospitable to critique, but the focus of critique has shifted from criticising society and positing viable ways of changing that society to criticising ourselves and our life-politics. Today, we are reflexive beings who constantly question what we are doing and express dissatisfaction with various aspects of our lives. The problem is that at the same time as us becoming more self-critical, we have lost control over the agenda which shapes our life-politics. Our reflexivity is shallow, it does not extend in any meaningful sense to our having control over the system in which we are embedded. Bauman now provides a ‘caravan park’ analogy to describe the way we tend to interact with society today. According to Bauman, we are mostly content to limit our concerns to what goes on in our own individual caravans, and we only want to engage with other caravan dwellers occasionally and in a non-committal manner, reserving the right to up and leave when we choose. We only ever complain about the caravan park when certain services break down, such as the electricity or water supply, otherwise we are happy to let it run itself, without feeling any need to to commit to it, or question the way it is run. This is very different to the type of social engagement that was the norm when Adorno developed his critical theory. At that time, Bauman suggests, many more people treated society as if it were their house, and acted within it as if they were permanent residents who could, if necessary, alter the structure of that house. Moving onto one of the central themes in Bauman’s work, he now argues that this changing mood of critical engagement with society (or lack of it) is because of the shift from heavy to light modernity which has resulted in a profound transformation of public space and, more generally, in the fashion in which the modern society works and perpetuates itself. Bauman notes that heavy modernity was endemically pregnant with the possibility of totalitarianism – the threat of an enforced homogeneity, the enemy of contingency, variety and ambiguity. The principal icons of the era were the fordist factory, with its simple routines, and bureaucracy, in which identities and social bonds meant nothing. The methods of control in this period were the panopticon, Big Brother and the Gulag. It was in this period of history that the dystopias of Orwell and Huxley made sense to people (which they no longer do) and that the defense of individual autonomy and creativity against such things as mass culture offered by critical theory appealed to a wide body of citizens. However, in liquid modernity, we are no longer constrained by industry, bureaucracy and the panopticon, and Orwell’s dystopia no longer seems possible. Liquid Modern society, however, is no less modern than it was 100 years ago, because it is still obsessed with modernising, with creative destruction… with phasing out, cutting out, merging, downsizing, dismantling, becoming more productive or competitive, and, just as with heavy modernity, fulfillment is always somewhere in the future. Firstly, the end of the idea of perfectibility: we no longer believe that there will be an end to the process of modernisation – it has become a perpetual process. Secondly, we are now expected to find individual solutions to our problems. Gone is the idea that reason applied to social organisation can improve our lives, gone is the ideal of the just society. No longer are we to solve our problems collectively through Politics (with a capital P), but it is put upon the individual to look to themselves to solve their life-problems, or to improve themselves. Casting members as individuals is the trade mark of modern society and this casting is an activity re-enacted daily. Modern society exists in its incessant activity of ‘individualising’. To put it in a nutshell, individualisation consists of transforming human identity from a given into a task and charging actors with the responsibility for performing that task and for the consequences (also the side effects) of their actions. Bauman now points to another difference between heavy and liquid modernity. In the period of ‘heavy modernity’, having been disembedded from previous social-locations, people sought to re-embed themselves in society, through, for example, identifying as a member of a stable social class. By contrast, in today’s modernising society, we have no stable beds for re-embedding, we just have musical chairs, and so people are constantly on the move. In the liquid modern world, there is no end of the road, nowhere for us to ‘re-embed’. In the age of liquid modernity the option to escape individualisation and to refuse to participate is not on the agenda -Individualisation is not a choice – to refuse to participate in the game is not an option. In the Liquid Modern society, how one lives becomes a biographical solution to systemic contradictions – risks and contradictions go on being socially produced; it is just the duty and the necessity to cope with them which are being individualised. A gap is growing between individuality as fate and the ability for genuine self-assertion. The self-assertive capacity of men and women falls short of what genuine self-constitution would require..
Bauman now distinguishes between the citizen and the person – the former seeks their well-being in the city (read ‘society’), while the later is unconcerned with collective well-being. and basically makes the argument that part of individualisation is the ending of citizenship. Another unfortunate aspect of the Liquid Modern era is that, rather than being used to discuss public issues, public space is brimming with private problems – where people’s individual problems and their individualised biographical solutions are discussed, without any consideration of the social conditions which gave rise to those problems. Bauman rounds off this section by pointing out that in today’s society, the chances of being re-embedded are thin, and this means that new communities are wandering and fragile, and he alludes to the fact that newly-emerging networks with low commitment are not sufficient to empower individuals. ‘What emerges from the fading social norms is naked, frightened aggressive ego, in search of love and help. In the search for itself and an affectionate sociality, it easily gets lost in the jungle of the self.. Someone who is poking around in the fog of his or her own self is no longer capable of noticing that this isoloation, this solitary confinement of the ego’ is a mass sentence’. The modernising impulse means the compulsive critique of reality, and the privatisation of that impulse means compulsive self-critique, and perpetual self-disaffection. It means that we look harder and harder at how we can improve ourselves. I’m in two minds about what to make of Bauman’s idea of perpetual disaffection – On the one hand I’m impressed by the sympathy for the basic plight of the individual – it is, after all, an experience of the perpetual suffering that accompanies the human condition; on the other hand I’m concerned that what Bauman’s going to try and argue later on is that this disaffection will disappear once individuals gain some greater degree of control over the process of their self determination. In Buddhism, the fact the individual seeks to self-determine in the first place is the source of the disaffection, so this won’t be remedied through merely reinventing one’s relations with one’s social context (although this is part of the process in Buddhism – through right livelihood) – this disaffection is probably better seen as individuals en mass realising their true nature – and this needs a deeper solution, which will combine the various factors found in the Noble Eightfold Path. The problem with this is that there are no ‘biographical solutions’ to systemic contradictions – except for imaginary ones, and as a result, there is a need for us to collectively hang our fears on something – and so we scapegoat ‘strangers’, and go along with moral panics, it is these kind of fears which fill the public space voided of properly public concerns. The job of critical theory is now to repopulate the public sphere – to bring back politics with a capital P – to bring back the two groups of actors who have retreated from it – The person and the elite. People do not engage because they see the public sphere as merely a space in which to private troubles without making any ‘public connections’. The elite meanwhile now exist in ‘outer space’ and remain for the most part invisible, their favourite strategic principles being escape, avoidance and disengagement. The job of critical theory is to figure out how to empower individuals so they have some level of control over the resources which they require for genuine self-determination. Bauman starts with a section devoted to Adorno’s view that the act of thinking is itself freedom, but that any attempt to give thoughts a market value threatens the genuine value of thought. He then talks about the tension between ‘the cleanliness of pure philosophy’ – drawing on the notion of the withdrawn intellectual contemplating life and refining systems of thought and the problem of then applying the ‘truths’ found to the ‘dirty business’ of getting involved with the world of politics as one attempts to enact one’s ideas. He essentially argues that thought in isolation from society is useless – In order for it to have any value at all, thought has to be applied to society. Bauman concludes this section by pointing out that the unfortunate corollary of this is that whatever truths come to power will inevitably be tainted by those in power. In this summative section Bauman points out again that it is up the individual as an isolated actor to themselves find individualised solutions to social problems… He points to a range social situations, from us being called upon to adapt to neoliberal flexibalisation at work, to our efforts in seeking romance, and he rounds of my reminding us that any search for liberation today requires more not less public sphere, so any critical theory today must start from a critique of life-politics – a critique of the paucity of individualised solutions to systemic contradictions. 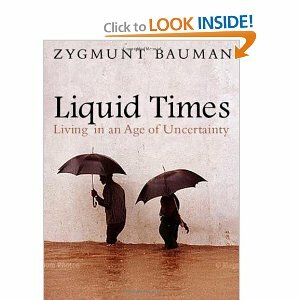 Bauman, Z (2000) Liquid Modernity, Polity Press. b. Frederick Jamieson argued that Post-Modernism is the ‘cultural logic of late capitalism’ – In the same way as modernist social theories are products of modernity – so post-modernism is a product of advanced capitalism – Capitalism has produced a world of fantastical objects and lifestyles – which invites those of lucky enough to be able to afford it to play rather than worry about the conditions under which our goods and services are produced – Post-modern thought which focuses on ‘how we play’ rather than worrying about the big problems that face us (poverty etc) could be seen as being similar to what the Transnational Capitalist Class want of us – that we identify ourselves as consumers and play rather than worry about the ‘dual logics of exploitation’ (people and planet) that lie behind the productive processes of late-Capitalism. c. Zygmunt Bauman argues that it is Capitalism that has produced this unstable post-modern world in which we live…And It tends to be the poor that experience instability in a negative way (think refugees) while the rich experience it in a positive way (we can ‘play in our consumer playground and avoid the worst bits of the world). If we want a better world we need to figure out a way of being more in control of what kind of world we are creating, rather than just accepting our fate as consumers and playing like little children. Lyotar’ds idea that now we are ‘free from the tyranny of metanarratives’ that’s as good it gets’ denies our capacity as humans to act collectively for the common good. d. Building on the above – thinkers on the left argue that p-m is a middle class, intellectual view point – a luxury of the chattering class – the new proletariat in the developing world may not see the relevance of post-modernism to their lives. e. Social thought that focuses on how we construct our identities in a world of hyper-reality is uncritical. One might argue that it suffers from a ‘myopia of the visible’. Just because the world appears more fragmented, and just because our media-mediated world is removed from reality doesn’t mean there isn’t a reality out there that needs to be understood – Lets face it once the oil runs out and three quarters of the planet is dying because of global warming ‘actual reality’ might once again begin to seem to be more real than hyper reality. Post modernists argue that we need new ways of thought to understand and conceptualise this new ‘post-modern society’ – the age old theories of modernity are no longer relevant! Lyotard refers to post-modernism as‘incredulity towards metanarratives’. A metanarrative is a theory that holds that it is the universal truth, or it contains within it a great hope of salvation if only everyone would go along with it! Science, religion, political ideologies are all metanarratives. According to Lyotard, in the postmodern world, people have seen all of these metanarratives turn to ashes, the promises they once held have turned out to be disastrous. The greater diversity and freedom of the post-modern age means that individuals abandon the search for one universal truth. Lyotard argues that this is a good thing, because the search for universal truths has led to such terror and oppression in the past. Hence post-modern diversity is good because it should promote tolerance! In a nutshell, Modernists tend to believe that if we can find the truth, then we can apply this to society and it will enable us to be free; while according to post-modernists, in order to be free, we need to be liberated from the concept of truth! Michel Foucault argued that the modernist Enlightenment project is a myth – throughout history knowledge has not been objective and it has not necessarily been used to make the world a better place. This is because the knowledge we collect about the world is shaped by the subjective views and values of those with power. Foucault illustrates this through exploring how societies have dealt with insanity and criminality throughout history. He basically argues that those in power define their own behaviours and values as ‘normal’ –and then those most unlike them as mentally ill or criminal – once these basic categories have been established, experts then emerge to construct ‘expert knowledge’ about why people are insane and how they are best treated. The labels ‘sane’ and ‘insane’ according to Foucault are subjective. To illustrate this, in the 1940s the social norm was to have children within marriage. Women who had children outside of wedlock were labelled as insane, and sometimes put in mental institutions and subjected to study by experts. The point here though is that there is nothing objective, value free, or progressive about the original categories of ‘sane’ and insane’ – these are simply a function of power. The post-modern era has witnessed a huge expansion in media technology. One consequence of this is that our society has an increased reliance on the media to tell us what is going on in the world. Jean Baudrillard argues that the media creates something called ‘hyper reality’ where what we see in the media is different from and yet more real than reality. Baudrillard argues that the media coverage of war for example is different to reality, yet is the only reality most of us know. The media is thus a world different from reality, and thus a modernist project that focuses on how ‘reality’ influences people’s lives and how we should try to ‘improve’ society seams irrelevant in a society where most people have not lived experience of this social reality. Transgression….. Because post-modern society is different, and as culture has become more important, it means that new areas have opened up for study. Such new areas include studies of rave culture, the study of new genders and the development of ‘queer theory’, and the emergence of cultural and media studies as sub- disciplines of sociology. Narrative – Much of this new post-modern sociology limits itself to a description of the ways of life of these groups, and at best tentative attempts to theorise specific to that group under study. Post-modernists are not interested in constructing generalise able social theory as they believe such a mission is flawed. 1 Strictly a post-structuralist, but for A level we can let that distinction pass!